Rare Vintage SpyCam On EBay | OhGizmo! By David Ponce on 07/13/06 • Leave a comment! This was a gadget in its day, so I figure it wouldn’t be too much of a problem putting it here. 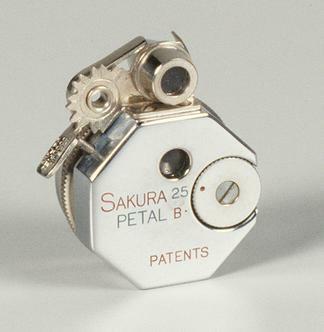 I’m helping a friend sell his 1948 Sakura Petal Octogonal Spy Camera. Apparently, these are quite rare, and prized by collectors. It was made in 1948, in occupied Japan (there’s an engraving on the side attesting to this). It’s about the size of an American quarter and is in mint condition. I’m told that if you’re into collecting antiques like these, you’ll know just how much it’s worth.